February 22nd 2014. 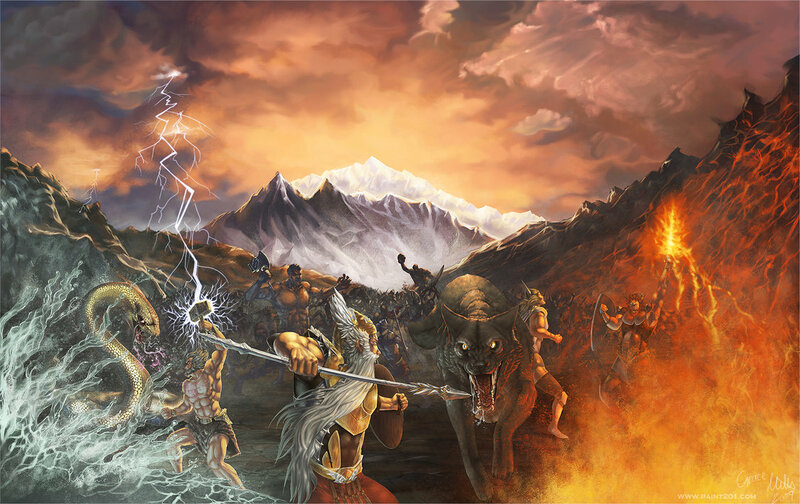 A day fated by Norse mythology to be the end of the world. The day Ragnarok came upon us. The pilots of RvB Ganked chose that day to roam into the Norse sounding area of low sec space belonging to the Minmatar, to spend their final hours in the heat of battle, to send many to Valhalla to be reborn when the world’s doom fell. And I was there. We had chosen to fly Minmatar hulls, specifically those capable of using missiles of various sorts – the Cyclone, the Bellicose and the Breacher. This was due to the Ragnarok titan having a doomsday weapon called the Gjallarhorn which is capable of a badass spew of missiles made of hellfire! We numbered over 180 and hoped that on such a fateful day others would be wandering the space lanes looking for an honourable end. And lo, the Gods themselves answered our call. We found a Suddenly Spaceships gang of Tengus and support in Egmar and so sent in many brave tacklers to keep them occupied before the bulk of our forces joined the battle and made short work of several of them, while their brothers fled. 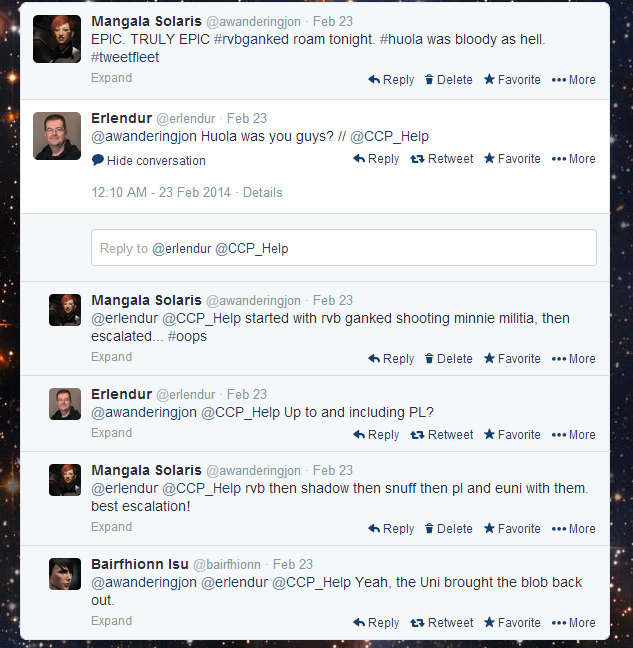 Our fleet moved on following this fight, eventually getting word of a Minmatar FW gang in Huola. The gang of cruisers and frigates entered a medium plex as we neared the system. I once again relied on our heroic tacklers to burn and establish tackle while many cruiser pilots followed on their heels. This fight was something for the ages as our cruiser and frigate pilots took on a vastly more organised force and did exceptionally well. Especially when you consider that the with bulk of the fleet being in battlecruisers (medium plex are restricted to T2 cruisers and below), we had to listen to the carnage caused by our brothers in arms as they burned through the enemy within the confines of the plex. Many heroes stepped forward to urge their fellows on and just when it looked like the field would be held by RvB Ganked, we heard from our scouts that Suddenly Spaceships were on the way to Huola to avenge their Tengu losses. And they had brought allies in the form of Shadow Cartel. “Brothers will fight and kill each other, sisters’ children will defile kinship. Following some discussion with the Shadow Cartel FC about the possibility of Snuff Box heading to Huola and how we should appear to be fighting one another then turn on them when they arrived, I reformed the RvB Ganked fleet as quickly as possible. My forces still numbering over 180 thanks to the well supplied market available in Huola, we hit the field and immediately we went to work on the Suddenly & Shadow logistics with some switching between other hulls as opportunities arose. And then Snuff Box arrived, too late for the Suddenly & Shadow gang to turn on them, as I had unfortunately deprived them of their logistics. Once again I regrouped the Ganked fleet, and had a standoff in local with Snuff. Meanwhile, news of the battle was spreading. This news obviously spread far enough for Pandemic Legion to take an interest. They arranged with me to engage Snuff Box upon which time they would enter the fray to punish their mortal enemies. However, I told my fleet this, forgetting that we were being streamed. The plan was ruined. However, it seems Snuff had a plan of their own. 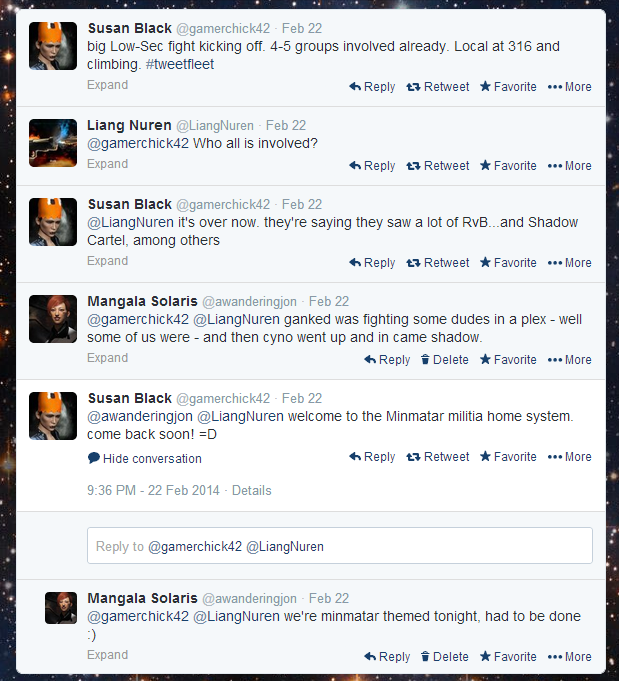 They contacted the forces of Suddenly & Shadow Cartel and asked them to return to the fray. They too the opportunity to engage PL, who escalated from battleships to capitals, as the system population kept rising and more brave warriors leapt into the battle. Ships exploded all around the Otelen gate as more and more parties arrived, the most notable of which was a 200 pilot EVE University fleet. This fleet could have turned the tide against PL and their capitals, however they chose to ally with the Legion, to the point of bringing in their own capital ships. This alliance, and the distrust felt by the rest of us towards one another, gave EVE University and Pandemic Legion the field, but only once many hundreds of pilots had been sent to Valhalla to await the coming of Ragnarok. As for the Ragnarok that had been ordained, it never came to pass, but in such a conflagration as occurred in Huola, who would have noticed.